Prabalgad or Muranjan fort fort is easily visible while travelling through the Mumbai-Pune Expressway. To its east is Ulhas river, Gadi river to the west, Patalganga river and Manikgad fort to its South, Karnala fort to its North west and Irshalgad nearby. The Kalavantin pinnacle which stands next to it gives a �V� shaped valley. From the sunset point of Matheran sunset can be seen at this very V spot. 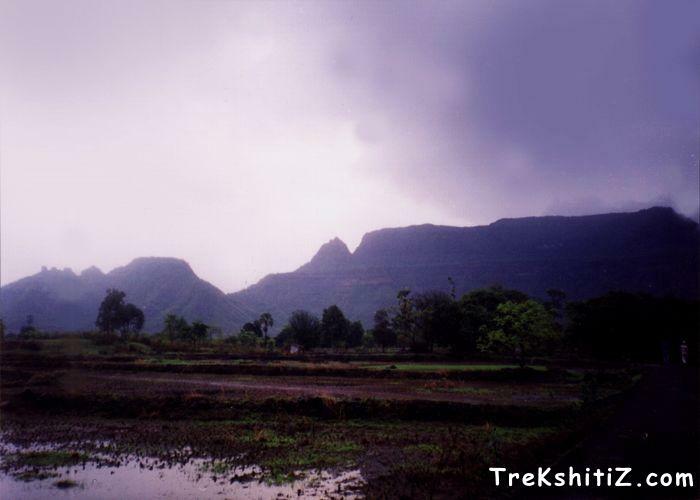 Primarily Prabalgad was the choice of the British to develop as a hill station but due to the absence of water Matheran got the honour. This fort might have been built to protect the areas of Panvel and Kalyan which were prominent ports that time. The caves on the hill point towards the Buddhist era. Due to these caves only the Shilahar and Yadav kings made this a military check post and named it �Muranjan�. The fort might have been built on this hill during the Bahamani era and later the control went to the Nizam of Ahmednagar. When the Mughals and Adilshah of Bijapur led an attack on King Shahaji who was then a Nizam commander, he took a refuge in Kondhana and Murumbdev hills. Later he approached the Siddi of Janjira and the Portuguese of Chaul for help but he met no success. Thus at last he took refuge in Prabalgad fort with his wifr Jijabai and his younger son King Shivaji in 1636. When the Mahuli treaty was signed, North Konkan region fell into the hands of Mughals but Adilshah still had a direct control over it. Later in 1656 when Shivaji Maharaj took over Jawali region by defeating Chandrarao More, at the same time the commander of Shivaji, Abaji Mahadeo took control over Kalyan, Bhiwandi to Cheul and Rayri and that time Muranjan came under the Maratha reign. The fort was then renamed to Prabalgad. In 1665, according to the treaty of Purandar Prabalgad was included in the 23 forts handed over to the Mughals. Mirzaraje Jaisingh, the Rajput commander of the Mughals who looked after the treaty appointed Kesharsingh Hada as the fort in-charge. When the treaty was broken, Marathas attacked Prabalgad and Kesharsingh was killed. Before that the Rajput ladies adopted �johar� i.e. laying one�s own body on the pyre. The mother of Kesharsingh and his two sons were found hiding in the trees who were then handed over to the Mughals in Deoolgaon village unharmed. Lot of treasure was found on the fort during restoration work. The summit of the fort is a huge plateau covered with dense forest. There is a temple of Lord Ganesh and 2-3 water tanks here. As the forest is very dense it is strongly advised to carry a local guide from the village to visit the fort and the water tanks. There are also remnants of some structures on the fort. Lot of points of Matheran can be seen from the top. Kalavantin pinnacle which stands adjacent to the fort can be accessed by rock cut steps by descending into the cleft. There is a water tank on the way of the steps. Reach Panvel and get down to Shedung junction on the Old Panvel � Pune highway. Shedung village can be reached in about 30 minutes. Proceed to Thakurwadi village which is the base village, 5 kms from Shedung. An unpaved road take us to Prabalmachi village in one hour time. From this village one can see Prabalgad fort and Kalavantin pinnacle in the front. There is a cleft between them which has steps carved in rock to access tht top of the pinnacle which takes 45 minutes. From the village, keep the fort summit to the left we reach a cleft in 30 minutes. The fort can be reached in one hour from here. Buses are available from Panvel to reach Thakurwadi. On the Panvel-Chowk road, there is Poinj junction next to Shedung junction. Proceed to Poinj village from here. There is a mountain ridge here which has to trailed to reach Prabalmachi village. Prabalgad is 1.5 to 2 hours from here. Reach Pisarnath temple near Charlotte lake in Matheran. Turning left from the temple we come to a cleft in 10 minutes and in 2 hours we reach Aaksarwadi village via a ladder route. The fort has to be reached from the plateau below the Kalaburuj(bastion) and then ascending the cleft and further to the fort. 25 to 30 people can be accommodated in the school in Shedung village.